The following information comes courtesy of http://www.beerpulse.com. 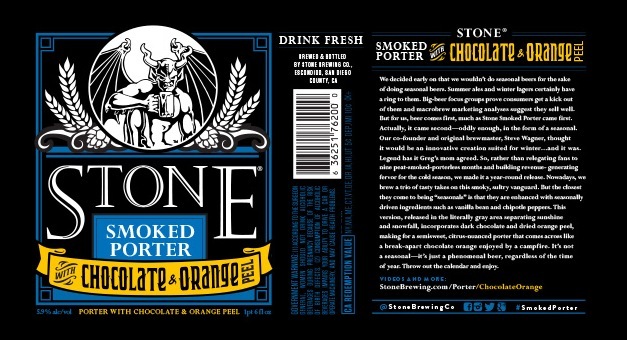 Another variant added to Stone’s Smoked Porter repertoire. We decided early on that we wouldn’t do seasonal beers for the sake of doing seasonal beers. Summer ales and winter lagers certainly have a ring to them. Big-beer focus groups prove consumers get a kick out of them, and macrobrew marketing analyses suggest they sell well. But for us, beer comes first, much as Stone Smoked Porter came first. Actually, it came second — oddly enough, in the form of a seasonal. Our co-founder and original brewmaster, Steve Wagner, thought it would be an innovative, warming creation suited for winter…and it was. This version, released in the literally gray area separating sunshine and snowfall, incorporates dark chocolate and orange peel, making for a semisweet, citrus-nuanced porter that comes across like a break-apart chocolate orange enjoyed by a campfire. It’s not a seasonal-it’s just a phenomenal beer, regardless of the time of year. Throw out the calendar and enjoy.